Noah Smith ponders the fact that Japan has now been in a liquidity trap for two decades, wondering whether that means prices have had enough time to adjust to restore full output and employment. Paul Krugman fires back suggesting that zombies have eaten Smith's brain that Smith is neglecting the "paradox of flexibility" (term from Krugman's paper, not his blog post). Background: In New Keynesian models, prices are "sticky," and because of this aggregate supply is upward-slopping with respect to inflation: higher inflation means higher output and higher employment in the short run. Normally, the central bank can raise and lower the inflation rate by adjusting the nominal interest rate--a lower nominal rate means higher inflation and more output. A situation where the nominal interest rate is 0%, meaning that the central bank cannot lower the rate and increase inflation, is called a "liquidity trap." Noah Smith's point is this: in the New Keynesian model, individual prices adjust slowly, which is why inflation has real effects on short-run output. But in the long run, prices adjust so that inflation is just that: inflation, with no impact on long-run output. Japan has been in the liquidity trap--where the nominal interest rate is stuck at 0%--for two decades, which surely must be enough time for all prices to fall commensurate with whatever fall in aggregate demand started this episode. Thus, by this logic, Japan should be pretty close to full employment and long-run output, despite their long-running liquidity trap. Paul Krugman's response leans heavily on Keynes, who commented that an aggregate price decline does not restore demand. Krugman quotes a passage of Keynes that, logically, is completely incoherent to me. Is Keynes suggesting that it is not possible to find a price system in which aggregate demand equals potential output? That means that an equilibrium doesn't even exist, which is certainly not what the typical New Keynesian model says about liquidity traps. Here is a graph of a stereotypical New Keynesian liquidity trap scenario, as you'll find in the works of Christiano, Eggertson, Woodford, and even some of Krugman's papers. The blue line is aggregate supply, which is upward sloping because of sticky prices--if prices were perfectly flexible, this line would be vertical and no stimulus efforts would have any effect on output--the longer it takes prices to adjust, the closer this line will be to horizontal. 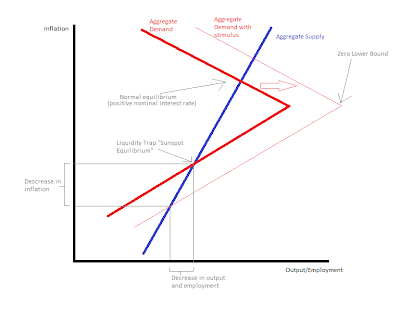 The bold red line is aggregate demand before any stimulus efforts. The slope of the red line depends on the length of the liquidity trap, for reasons I won't go into, but suffice it to say that the closer to horizontal the demand curve is, the longer the liquidity trap will last. You'll notice that there is a kink in the line. Above the kink is the realm of everything you learned in econ 101: supply-side policies are expansionary, nominal interest rates are positive, we have inflation instead of deflation. 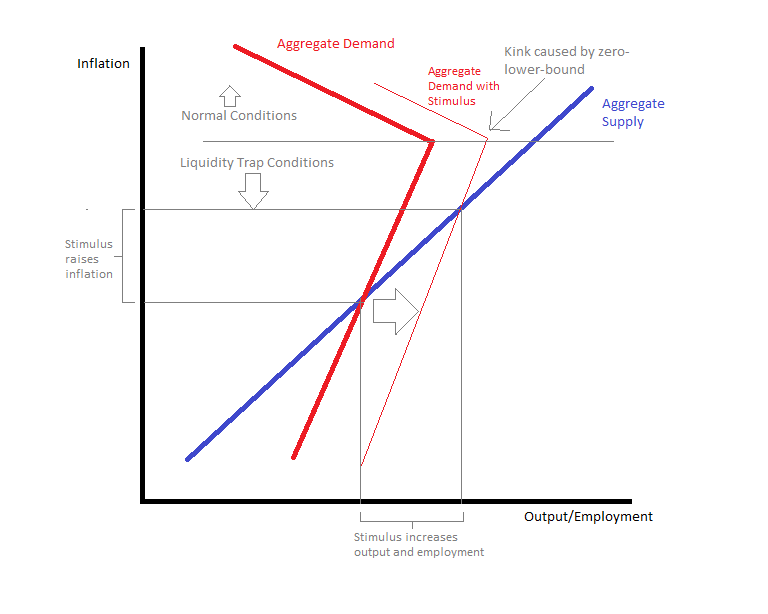 Below the kink is the liquidity trap, where all the comparative statics are reversed: supply-side measures are actually contractionary (go ahead, draw a new supply curve to the right of the blue line, then see where it intersects demand), and the only way to stimulate the economy is with demand-side stimulus. 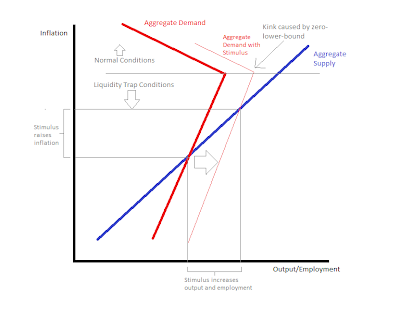 Normally, the demand curve intersects supply above the kink, but in a severe recession demand shifts so far to the left that it now intersects below the kink, and we get a liquidity trap. Why is there a kink? You can think about this in terms of real interest rates. The real interest rate is what people use to decide how much to consume or save--at higher real rates, they consume less and save more. The real interest rate, however, is the difference between the nominal interest rate and inflation, according to the fisher equation: $$real~interest~rate=nominal~interest~rate-inflation~rate$$ Thus, if the nominal interest rate is zero, the only way to lower the real interest rate is to raise inflation. Supply-side measures, which lower inflation, are actually contractionary because they increase the real interest rate, reducing consumption. What you see is that aggregate supply is now steeper than aggregate demand, and as a result it isn't possible for demand to intersect supply in only one point--there are now two equilibria. The top equilibrium is normal world, where interest rates are positive, inflation is high, and econ 101 applies. The bottom equilibrium is the liquidity trap, where we have low inflation, zero nominal interest rates, and strange comparative statics instead of pure econ 101. This is an example of a "sunspot equilibrium" because there is no intrinsic reason for switching from normal world to liquidity trap--such a recession could be caused by animal spirits or confidence or whatever bogeyman you choose to believe in (or, it could be caused by observing the number of sunspots, as some Victorian economists once theorized). 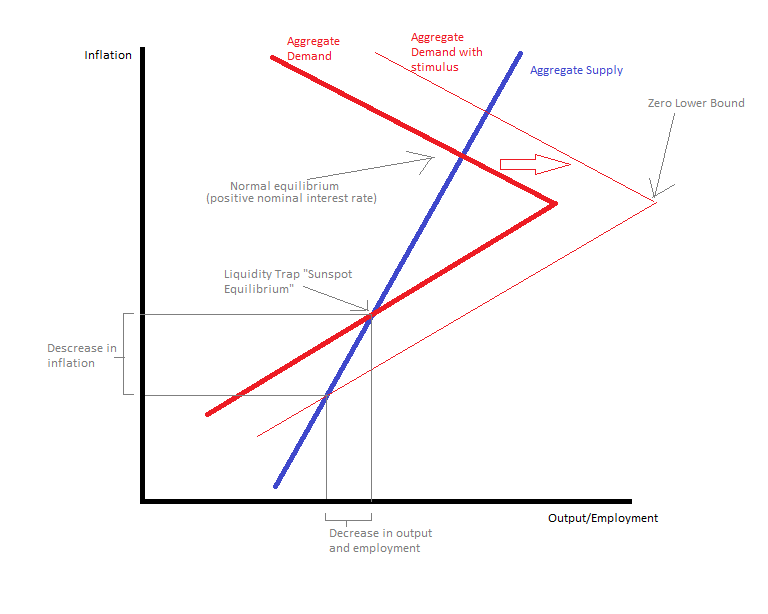 Point is, in the sunspot equilibrium, we are not at full employment or long-run output, and neither can fiscal stimulus take us there: increasing aggregate demand (moving from the bold red line to the skinny red line) actually causes deflation and decreases output and employment! I don't know of an easy way to intuit this result, but here's one attempt at explanation: the increase in demand at a given level of inflation would require that firms decrease prices, and hence, a rightward shift actually creates a self-fulfilling expectation of deflation, and because deflation raises the real interest rate, that increase in demand is more than offset by decreased consumption. In the previous graph, this effect was dampened by the fact that prices were stickier, and the liquidity trap shorter, both of which imply less expected deflation. From what I can glean from this paper, Krugman is relying on an entirely different mechanism for his comparative statics than in the other more standard New Keynesian models. In the standard model, deflation (or disinflation) at the zero lower bound is contractionary only because it raises the real interest rate. In Krugman's model, that effect still exists, but it is overwhelmed by the added feature whereby deflation is contractionary because it magnifies the real value of people's debts, shifting people into lower life-long consumption paths. In conclusion, I think Krugman's derision toward's Smith's post is a bit unwarranted. Krugman never "killed" the price flexibility "zombie idea," but rather he merely presented an alternative internally logically consistent model in which price flexibility doesn't help in a liquidity trap. Anecdotal evidence from Japan, and the Great Depression seem to support this theory, but it isn't the only theory that fits the facts. And, for the record, I don't see any empirics in Krugman's paper. However, part of what Krugman has said on the topic of price flexibility, I think, rings true regardless of which New Keynesian model is right. In both Krugman's paper and the standard New Keynesian framework above, policy efforts to decrease prices are likely to backfire, because the government doesn't literally set all the prices in the economy. Instead the policy instruments available to the government can only put downward pressure on the market clearing levels of prices, thus increasing the gap between the current and the market-clearing prices, and decreasing output and employment. This, as far as I can tell, is true of all imputations of the New Keynesian model at the zero-lower-bound. Yes, even this one.